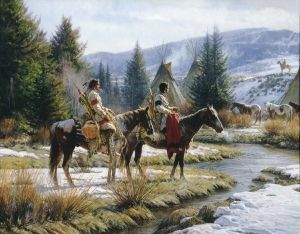 Morning Vigil by Martin Grelle is a beautiful, soft piece. It features an encampment beside a stream on a brisk, cold morning. A sentry watches for intruders who may have approached in the darkness. Paint ponies graze seeking grasses in the snow. And two brightly attired braves lend color and interest in the foreground. It is quintessential Grelle.